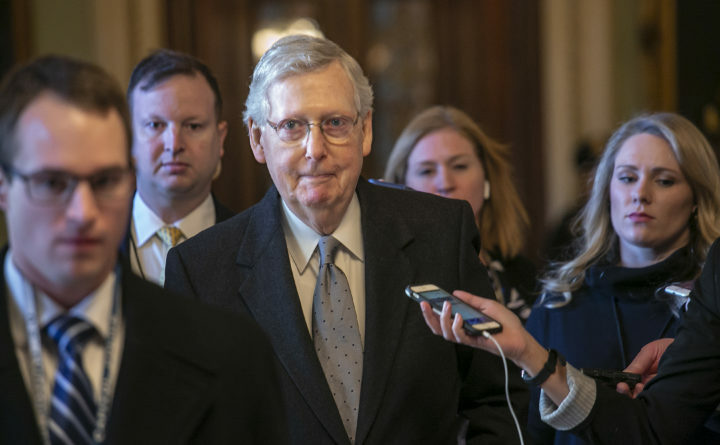 Senate Majority Leader Mitch McConnell, R-Kentucky, leaves the chamber Tuesday after speaking about his plan to move a 1,300-page spending measure, which includes $5.7 billion to fund President Donald Trump's proposed wall along the U.S.-Mexico border, the sticking point in the standoff between Trump and Democrats that has led to a partial government shutdown, at the Capitol in Washington. The U.S. Senate is scheduled to vote on Thursday on bills that could end the government shutdown. In the dysfunctional world that Washington, D.C., has become this is progress. Of course, voting on the bills may accomplish nothing, immediately. They aren’t likely to pass. The House may reject what the Senate passes, if anything. President Donald Trump may not sign a bill that passes both chambers. But, simply by voting on a couple bills, Sen. Mitch McConnell is finally taking a step to break the month-long logjam that has kept parts of the U.S. government shuttered and left hundreds of thousands of federal workers without paychecks. The Senate is expected to take up two bills. One is essentially the proposal Trump floated on Saturday, which includes more than $5 billion for a border wall along with temporary protections for two groups of immigrants. The other would reopen and fund the shutdown government agencies for three weeks but contains no money specifically for a border wall. Because many Democrats and Republicans are entrenched in their positions, neither bill is expected to get the 60 Senate votes needed for passage. This is bad news for federal workers who need — and deserve — paychecks. But, by stepping off the sidelines, the Senate action should be the start of more serious, and urgent, negotiations over how to end the shutdown. Here’s the quick version of the two bills the Senate is expected to consider. One is a bill to fund agencies included in the shutdown until Feb. 8, with the expectation that lawmakers will continue to negotiate a border security package. The other is Trump’s proposal, which he revealed during a speech from the White House on Saturday. It would fund the shuttered government through the end of September. It also includes $5.7 billion for a border wall and large increases in funding for detention and removal of immigrants. This bill also includes three years of protections for young people who were brought to America as children and for immigrants from Latin American countries who had been given temporary protected status. Since it was Trump who weakened existing protections for the so-called Dreamers, this is not much of an offer. Conservative commentator Hugh Hewitt made a persuasive case this week for following such a path. Harkening back to President Lyndon Johnson’s work to pass the Civil Rights Act, Hewitt urged the president to “go big” on an immigration reform package. Yes, he wrote, it should include funding for border security — even more than $25 billion — but it should also include permanent protection for millions of immigrants who came to the U.S. illegally. Hewitt suggest a pathway to citizenship for all immigrants who came to the U.S. illegally, other than the small group with criminal records. There are varied, and sometimes good, reasons to oppose the various proposals that have been made. At the core, arguing that federal workers and immigrants should not be held captive to Trump’s demand for a border wall is a principled stance. But Democrats must be careful not to completely close themselves off from any potential compromise. Framing the wall as an “immorality,” as House Speaker Nancy Pelosi has done, creates an unnecessary box for Democrats to negotiate out of. If increased border security, including new barriers, can help secure a larger immigration deal that enshrines protections for “Dreamers” and perhaps others — and that’s a big if — it’s worth pursuing. That’s not giving in to a hostage taker; it’s governing. At this point, the focus must be on ending the impasse before it does further damage to our economy or democracy. In working toward a resolution to this manufactured crisis, there is an opportunity to make big strides in improving America’s immigration policy in exchange for funding for border security. Like any compromise, it is not perfect, but this is a bargain that could solve many problems at one time.